Ten Strawberry Street Colored Red Rim Glass Charger Plate 13"
Home > Products > Ten Strawberry Street Colored Red Rim Glass Charger Plate 13"
Use the Ten Strawberry Street Colored Red Rim Glass Charger Plate 13" to add visual flair to your table setting. 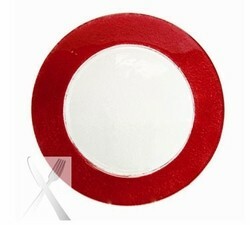 Beautifully designed with a gorgeous red hammered rim, this product adds a textured look, enhancing table decor. A must-have at wedding receptions or other formal occasions, this charger plate is made from exceptionally durable glass for years of use. A stylish and functional piece, this charger plate also protects against spills and mess that can stain your tablecloth. For proper cleaning and maintenance, hand washing is recommended.